This double orange daylily was obtained from my mother-in-law’s yard. I have seen this double feature become available only recently in commercial greenhouses. Daylililies are named as such because each bloom lasts only a day. There are usually anywhere from 4 to 8 flowers for each stalk that arises from the plant. Daylilies can bloom once per year, or may be repeat bloomers if the environmental conditions are “just right”. This daylily blooms only once—but really puts on a show for the time it is in bloom. Daylilies should be left to “naturalize” — continue to take care of them after the blooms have gone and this daylily will return each year with a beautiful show of blooms. The picture below shows the branch into two stalks, and how the plant appears after blooms have dropped off and an unopened bloom. The branched stalk results in twice as many blooms from a single stalk. 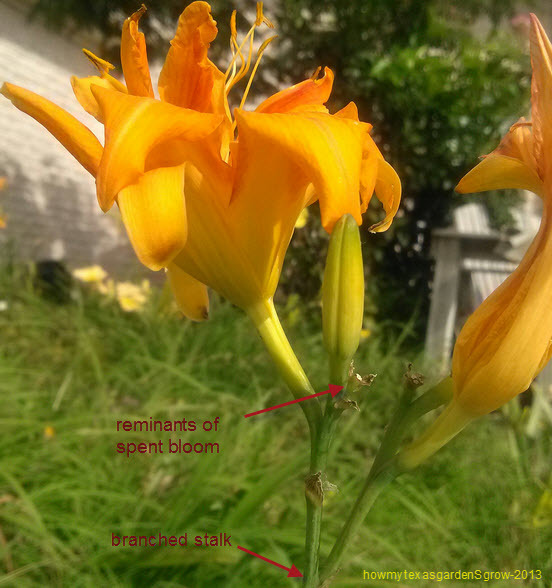 I’ve seen up to 6 stalks appear from each daylily cluster. Daylilies are perenials that return each year to bloom. This variety will freeze down to the ground each winter, and then reappears in the spring. I have others that die back but do not freeze to the ground in winter. 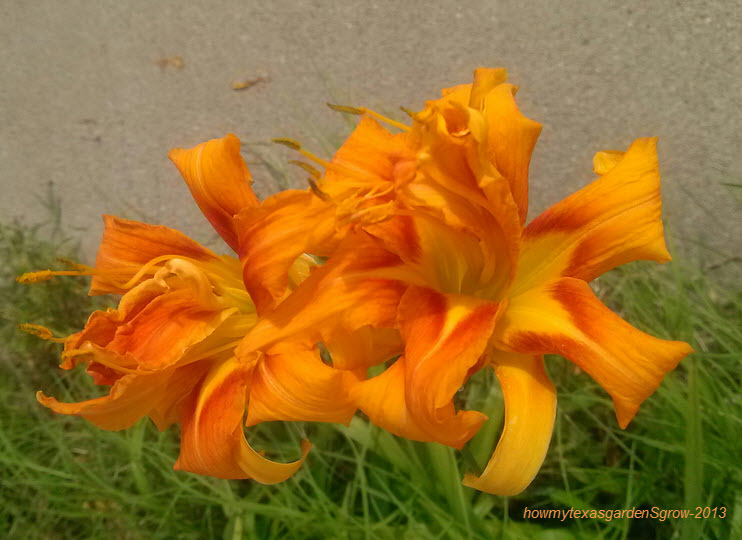 Are day-lilies deer resistant or deer candy? I suspect that hungry deer will at least sample the daylilies but I’ve read that Stella De Oro daylilies are resistant to deer feeding. I have not had any problem with deer–perhaps because my daylilies are very close to the house, I have dogs and the yard is fenced. Daylilies may not be deer candy under normal environmental conditions, but may become more appealing when there is little else to eat. We do, however, have a terrible problem with raccoons digging and eating the daylily tubers—more in drought conditions than in times of normal rainfall — to the point that some colors of my daylilies have completely disappeared. The only thing deer love to eat more than hostas and tulips are Lilly’s of all kinds including daylilies! !